Bibliophilia, Please: Armchair BEA Day 2 - Giveaways! What? I didn't lie? It's not an lolCAT - it's a bear! Anywho, I'm talking about the beautiful and hilarious Jaye Wells. I love her Sabina Kane series a lot, and the last book in the series released very recently. I'll be honest - I haven't read it yet because I'm not ready to say goodbye. Enough with my ramblings because I know you're here to WIN! I'm going to give you the choice of ONE book by Jaye Wells. Click the green Rafflecopter button. I'm going to offer an extra entry for tweeting this time. Thanks for the giveaway! 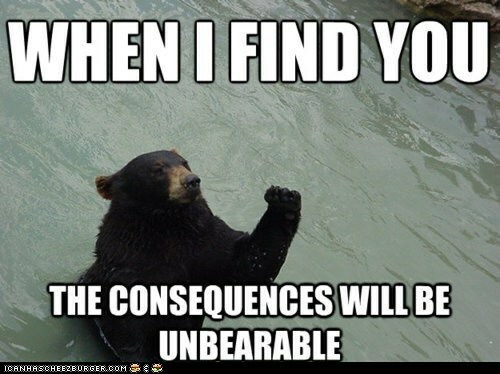 And the lolBEAR. I needed it. This is a new author to me, but sounds interesting. Thanks for hosting. Thanks for the giveaway. I haven't read her books before. Here's my Armchair BEA Best of 2012 post and my giveaway post for today! Love the bear, and thanks for the giveaway! I haven't read this author, but I've heard really good things. Ivegot a giveaway going at my blog today as well. I'm just "window shopping" through the giveaways. I love seeing what everyone is offering, but my TBR pile is teetering so no more books for me.